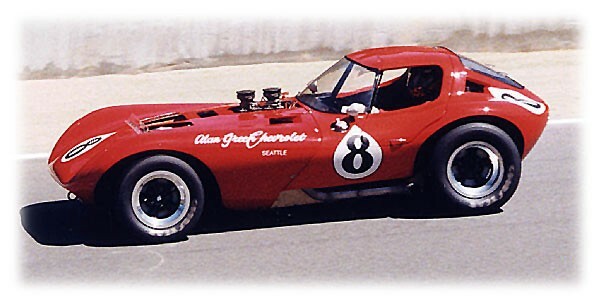 The Cheetah GT V8 was built in 1963 by Bill Thomas, who aimed to build a car with a very high power to weight ratio to beat the new Shelby Cobra's. However, after 25 cars were built, his factory was burnt down, and Chevrolet withdrew their backing. Chassis Type Spaceframe Race Works chassis painted silver and had 9 additional gussetts and were built using 4130 chromoly tubing. They used solid mounts for the engine, transmission and differential. The Seats were stationary while the pedals could be adjusted to fit the driver. Body The first 2 were aluminum, then they were created made using fiberglass with a green gelcoat, and then painted. There were 8 pieces that were joined together. Capacity 5351 cc / 327 cu.in. Fuel Injection Rochester modified dual meter unit. Gearbox 4-speed manual shift Muncie M21 or M22 RockCrushers. Clutch Standard 327 flywheel with an 8 1/2" clutch, 2200lb. pressure plate, hydraulic throw-out bearing, 26 spline, 6" shaft and u-joint. Final Drive Chevrolet heavy-duty aluminum differential as used on 1962 Corvette Grandsports. Front Tubular A-arms, Monroe coil-over, adjustable shocks. Rear Fabricated tube arms and Monroe coil-over, adjustable shocks. Brakes (Front and rear) Dual cylinder 11" (279 mm) Chevrolet Nascar drums with cerametallic linings. Steering 1962 Chevrolet Station Wagon heavy-duty spindles, Triumph Herald box & rack (Also found on Spitfires). Bell Auto Parts 15 1/2" steering wheel.